A retired Italian mayor has broken a long silence on his highly unusual war service THE former mayor of a mountain village has revealed after more than 50 years that he was once "Hitler's Italian waiter". 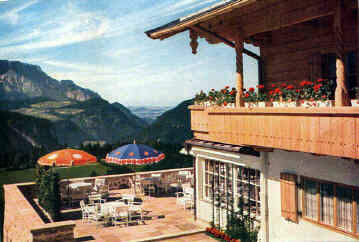 Salvatore Paolini, 79, says that he was the only Italian member of staff at Hitler's mountain lair, the "Eagle's Nest", at Obersalzberg near Berchtesgaden in the Bavarian Alps. There he served Hitler and his senior officers and discovered that the dictator rarely drank but liked to indulge his fondness for puddings and cream cakes. After 20 years as mayor of Villa Santa Maria in the hills of Abruzzo, Signor Paolini retired four years ago, but few were aware that as a teenager he had waited at Hitler's table - until he was tracked down by the newspaper Il Giornale. Signor Paolini, who started work at an hotel in his village at 14, left to "learn languages and earn more money" and found a job on the Italian Mediterranean Riviera at a hotel popular with German officers. "They helped me to get a job at a German spa town where the director of the Platterhof, the big hotel at Obersalzberg, often came," he said. "When he saw I was tall and handsome, young and strong and had learnt to speak German quite well, he offered me a job at the Eagle's Nest. I served Hitler many times, but it never seemed like an historic event. "I only realised something important was going on when I noticed security agents arriving before meals and tasting everything that went to the table. Suddenly, the Führer would arrive. I couldn't work out where he materialised from. I didn't realise that there was a secret passageway." He supports the contention that Hitler was virtually teetotal and vegetarian. "He did like sausages and ham, but on the whole he never ate meat, preferring potatoes and green vegetables. They were always very highly spiced because he had lost his sense of taste after a mustard gas attack in the First World War." What Hitler "really adored were puddings, all kinds of desserts, especially huge cakes covered in whipped cream". Hitler was "not much of a drinker", Signor Paolini said. "The wine waiter opened the bottles, always vintage wine, but he scarcely drank anything. We always had to make sure there were plenty of water jugs on the table." "We all realised then that Goering had fallen from favour." 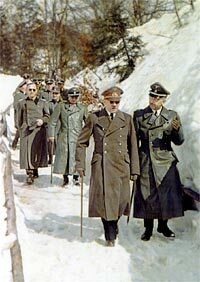 Eventually Goering retired from the Nazi inner circle after a series of disastrous lapses in Luftwaffe defences. He survived the war to face trial. Signor Paolini said that he never saw Hitler in a temper. "He never raised his voice, and he didn't really look like those pictures of him. It was a convivial atmosphere in the dining room. He sat at the centre of the table with his back to the wall, so that he could look out at the view. Eva Braun used to come to lunch, too, but Hitler never let her sit next to him." He said that Hitler never complained about the food. "He always said 'very good' to us as he left." 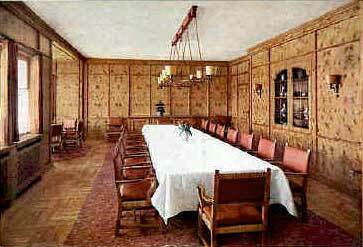 Later Signor Paolini served in Hitler's private dining room at Nuremberg. He took two souvenirs from Hitler's room - the door handle and a small wrought iron statuette showing two tramps, one playing a trumpet and the other a violin - after Nuremberg was bombed. After the war, he worked at hotels on the Venice Lido and in Rome before returning home. Villa Santa Maria was one of the few villages not blown up by the retreating Nazis at the end of the war. He suspected that this was because of his time in Hitler's service.